This year’s School Education Examination (formerly the School Leaving Certificate) results are out and we could not be more thrilled to share with you all that the Little Sisters passed with flying colors! Many Little Sisters earned very top marks, all earned at least “Acceptable” grades, and overall the 166 Little Sisters who took the test performed much better than the national average. LSF more than tripled the national achievement rate for girls in each of the highest three categories! The Little Sisters not only beat the national averages, but they also excelled when compared to the scores of the rest of the girls in Nepal. 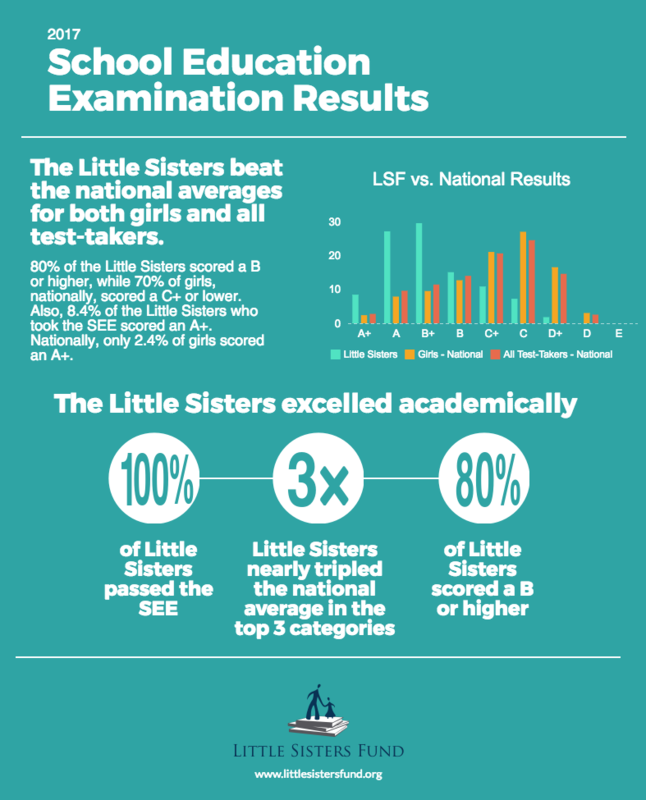 The national imbalance of most girls scoring a C+ or lower on the SEE was not at all apparent in the Little Sisters’ results. In fact, it was the opposite! While almost 70% of Nepali girls scored in the bottom 5 categories (a C+ or lower), 80% of the Little Sisters scored in the top four categories (a B or higher). We flipped the trend on its head! Congratulations to all girls on the very strong results after many years of diligent study! These results are especially impressive given the monumental challenges of the past year. And special congratulations to the 14 girls who earned A+. Less than 2.8% off all test-takers did that well! Way to go Suvechchha, Bijita, Sanskriti, Swopnil, Sanjima, Nirmala, Sunita, Nirmala, Samridhi, Apeachhya, Ridhima, Bhagawati, Pramila, and Manju!